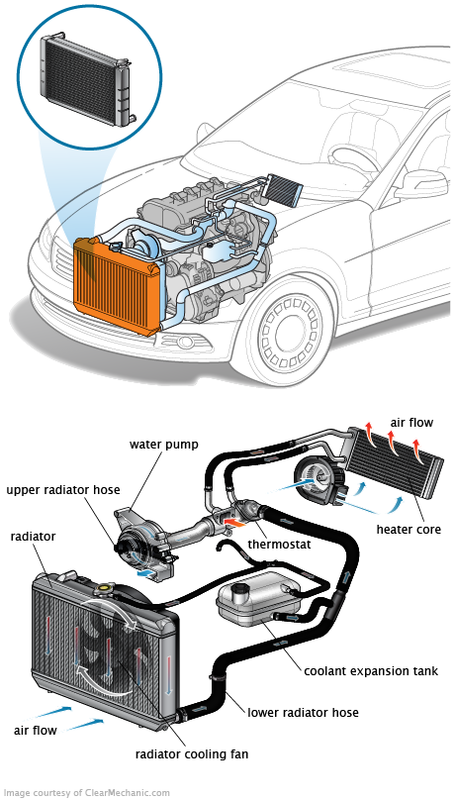 The radiator is part of the system that keeps your car from overheating. It helps transfer high temperatures from the running engine to the outside air. Leaking: As a radiator ages, it may become fatigued and crack, allowing coolant to leak out. Overheating: If the radiator leaks, gets clogged or its fins become obstructed, the vehicle may overheat. This can seriously damage the engine. Warning lights: If the radiator springs a leak, expect a low coolant level warning to appear on the dash. The check engine light may also come on as further problems begin to occur. And if the vehicle begins to overheat, the temperature gauge will spike. Inoperative cabin heater: The passenger area inside a vehicle is warmed up by the blower fan and a mini-radiator, called the heater core. An unobstructed supply of hot coolant must pass through the core for it to work. It may not get enough flow to warm the cabin if the radiator is leaking or clogged. Coolant and transmission fluid mixing: If the transmission fluid cooler inside the radiator bursts, that fluid and coolant can mix together. This can damage one or both of the systems. A radiator is made of a series of tubes surrounded by a network of fins. There are also two tanks — the intake and outlet — one at each end of the radiator. Upper and lower hoses connect the tanks to the engine. Coolant carries heat from the engine and fills the radiator (and the rest of the cooling system). The liquid mixture of antifreeze and water first enters the radiator through the intake tank. It then makes its way through the tubes, which sit behind the fins, before exiting via the outlet tank. When a vehicle is moving, air enters through the front grille. That airflow is directed across the radiator’s tubes by the cooling fins. As a result, heat is removed from the coolant before it heads back to the engine. If the car is idling or running very slowly, a fan is used since there isn’t enough outside airflow being pushed into the engine compartment. Another key part of the radiator is the cap. When the cooling system reaches maximum pressure, a valve inside the cap opens and coolant flows into the recovery tank. When it then cools and the pressure eases, the cap vacuum valve opens. This lets the coolant flow the opposite direction, back into the radiator. Most vehicles with an automatic transmission also have a transmission fluid cooler inside the radiator. Inlet and outlet lines allow the transmission fluid to flow back and forth. A cracked or failed radiator should be replaced right away to avoid engine overheating and further damage. The job is fairly involved and, in most cases, should be performed by a professional. It’s always a good idea to do a cooling system flush after replacing the radiator, especially if the failure was caused by a clog or mixed fluid. As a preventative measure, many repair facilities also recommend replacing the upper and lower radiator hoses, along with the thermostat. After the repair is complete, the cooling system will need to bled of air to keep the engine from overheating. Some coolant flush machines have a vacuum fill feature that easily takes care of this. Others do not, and the bleeding procedure must be performed separately.